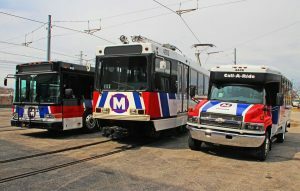 Blue Line – Operates from Shrewsbury, Mo. to Fairview Heights, Ill.
Based on passenger surveys, 84 percent of Metro transit riders use the system to get to work, and 20 percent to get to school. Studies show that every $1 invested in public transportation produces approximately $4 in economic returns. Since 2011, more than $7.9 billion in commercial development has been completed or is currently under construction within a half-mile radius of MetroLink stations.